Clicking Repeat this item will provide a pop up with the following view. This view allows you to repeat an item weekly or daily, monthly and more. Select the date the repeat occurrence is set to start and click create items. Anything in the Draft Section or associated workflow dates will not be copied over. You can either complete a Calendar Item by forcing it to be complete or by completing the stages in the workflow to the final stage. Marking a Calendar Item complete will skip the workflow stages of the item and mark an item as completed. 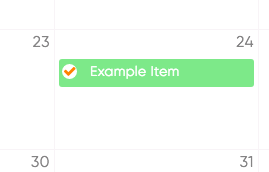 When stages are skipped and the workflow is 'forced' to complete, the Editorial Calendar will present this Calendar Item with an ORANGE check mark. Whereas a Calendar Item that goes through the normal approval process in each stage will get marked with a GREEN check mark when completed. This item will move content item to the Archive. 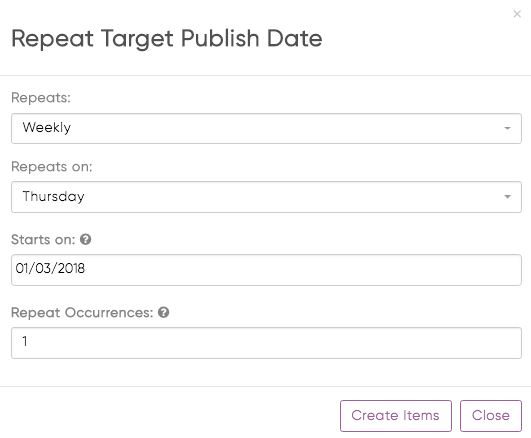 Moving an item to Archive will remove the item from the Editorial Calendar view but not delete it. It will still be accessible through In-Production under the Calendar tab in the navigation. This item will move content item to a backlogged state. It will remove it from the calendar, but still be accessible via In-Production under the Calendar tab in the navigation. Moving an item to Request will move the item from it's current workflow and bump it back to a pre-approval stage.